Here it is right on the edge of the path and more or less on the normal high-tide limit where presumably it has found a niche, away from the salt-marsh plants which might crowd it out (such as the taller grasses behing it) and where the soil is trodden to keep at bay other plants. 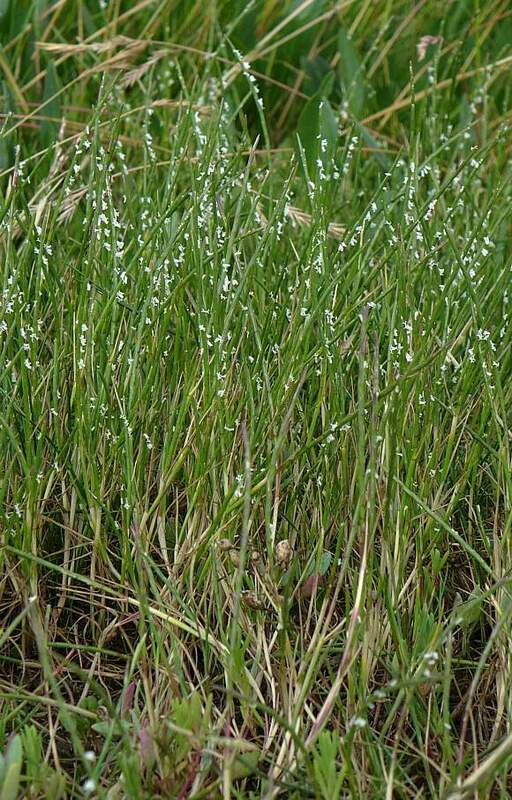 It grows to about 40cm high and has straight stems (although a few might be curved like Curved Hard-grass (Parapholis incurva)) which is much shorter at only 10cm, has even smaller anthers, is rarer and does not occur anywhere near the Sefton Coast. 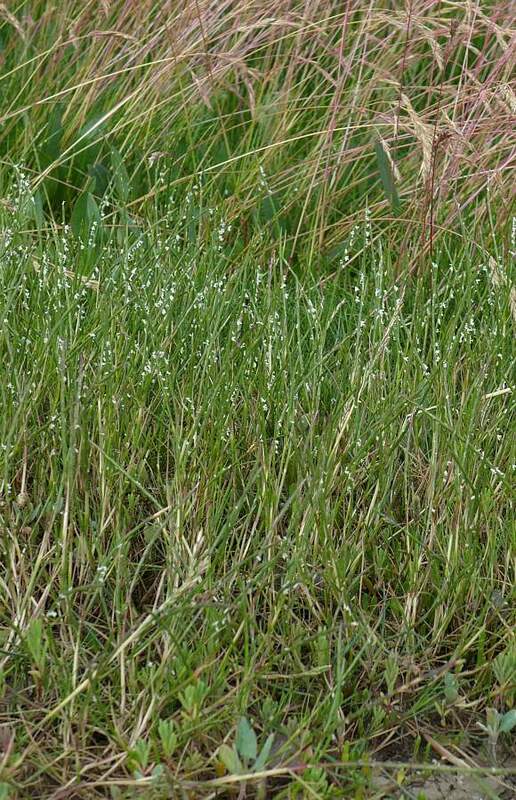 The two species taken together are distinctive and probably cannot be mistaken for any other grass. It is branched much lower down near the roots and has just a few short leaves. 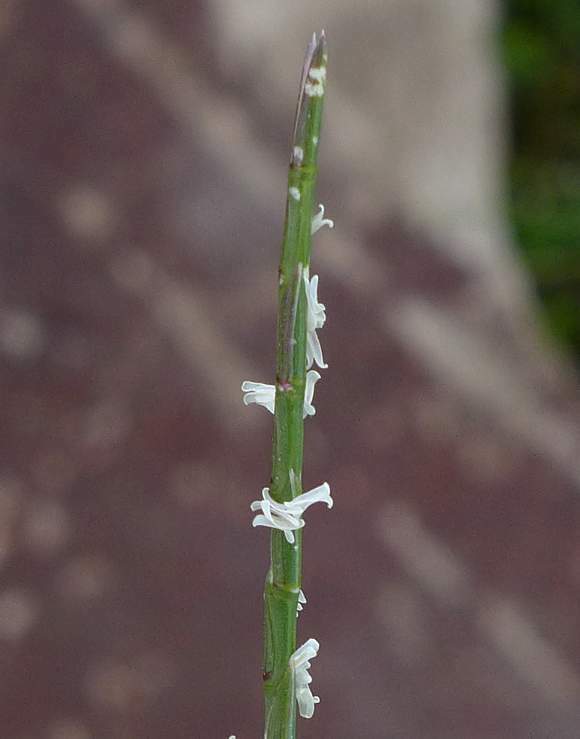 It is a very thin, cylindrical grass, tapering to a double-point at the top. 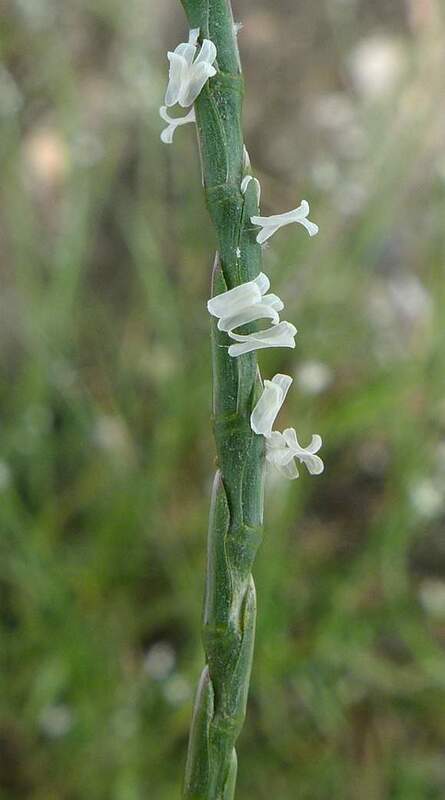 Distintively, it is sparsely populated by tiny white anthers which poke out from beneath a spikelet and dance about in the slightest breeze which are also easily knocked off. 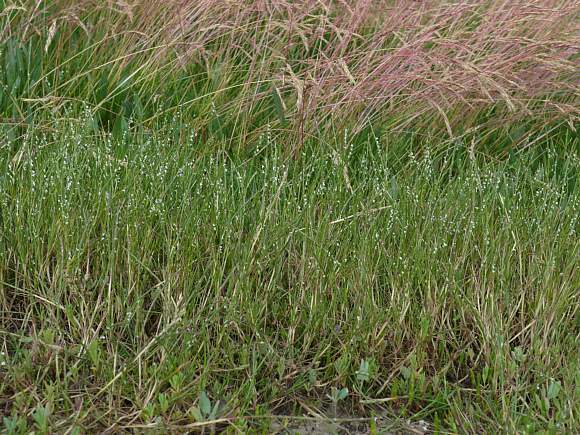 Pairs of spikelets on opposite sides of the thin round stiff and hard stems adorn the stems, each with their own tiny dancing anthers. It ends in a pair of opposite spikelets which taper to a point. The spikelets are alternately at right-angles to each other up the stem. 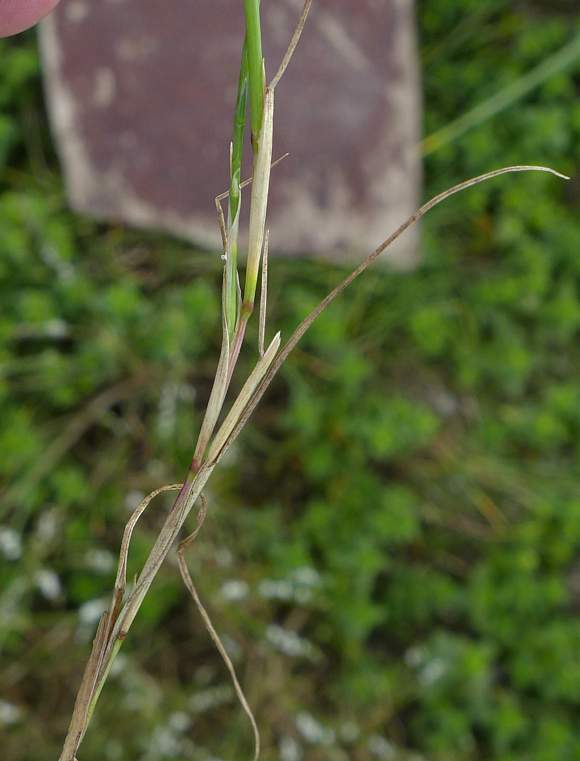 The spikelets are shield-shaped and hug the stem when new. The stem, from close-range, is not as round as it may at first appear, and bulges slightly at each spikelet. The grass from above, this specimen has been trampled flatter. Half-way down the stem it looks like almost any other grass. 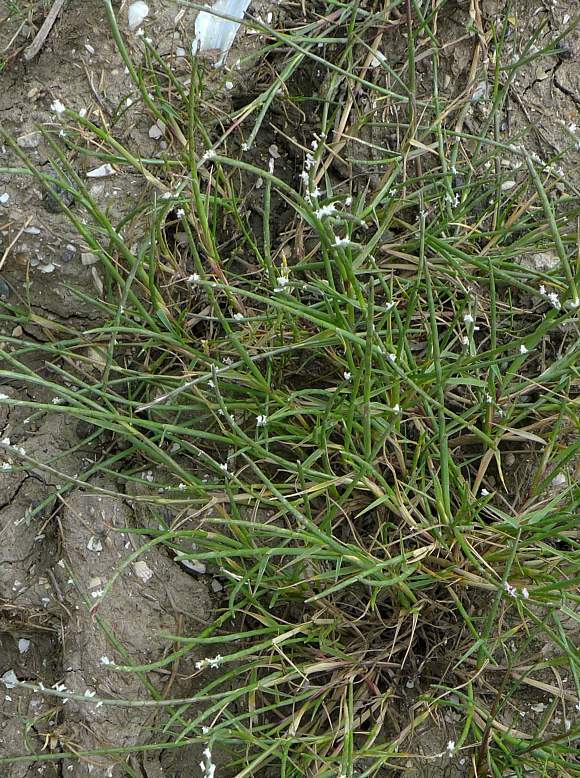 It is an annual grass which grows in bare or grassy places beside the sea, but not in it. 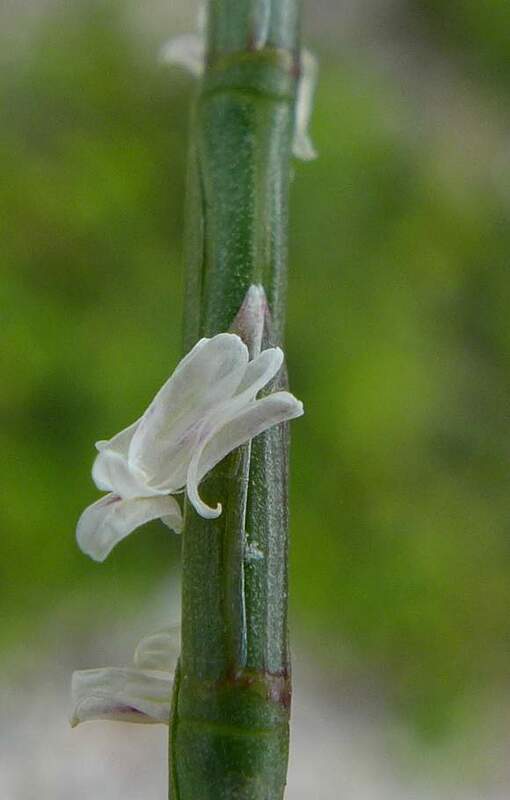 It is very thin and hard and normally straight with tiny white anthers at intervals fluttering about in the slightest breeze. 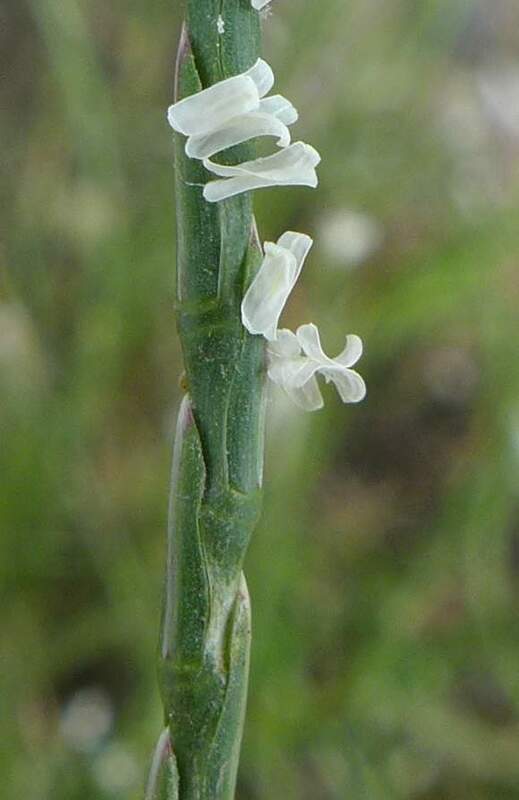 Sexually it is cleistogamous whereby a plant can automatically self-pollinate itself by means of flowers which do not open. Cleistogamy is an efficient process requiring less energy to produce seeds than the normal routes involving petals, nectar and large amounts of pollen (although the first two seem not to apply for grasses? ).